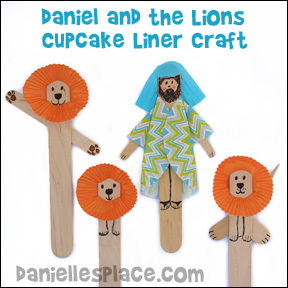 Children color the pictures of Daniel and the lions with their mouths open and their mouths closed and the angel. They tape the picture of the lion's with their mouths closed to the bottom of the picture and the angel to the side. 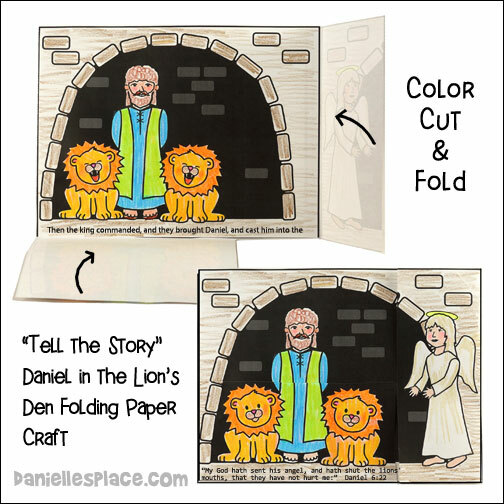 Children tell the story of Daniel as they fold the angel picture so the angel appears in the story, and then fold up the lions with their mouth's closed and tell how the angel helped Daniel by closing the mouths of the lions. 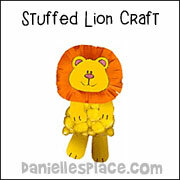 The Printable Patterns for this craft are available to members on The Resource Room. A full-sized printable diagram pattern is available to members. 1. Flatten two two-inch cupcake liners. Tape or glue a jumbo craft stick in the center of one of the flattened cupcake liners. (If you don't have cupcake liners, you can use 4 1/2" circles cut from patterned paper. To make the shepherd's robe fold one side of the cupcake liner over the jumbo craft stick as shown in the diagram (Diagram 1). 2. Fold the other side over the jumbo craft stick overlapping the first fold (Diagram 2). 3. To make the arms flatten a one-inch cupcake liner and cut it into quarters. (If you don't have cupcake liners, you can just use 4 1/2" circles. 4. Fold the sides of the cupcake liner quarters in on both sides to make the sleeves (Diagram 3). Glue mini craft stick inside the sleeves for the arms. 5. Glue or tape the arms onto the back of the body piece. 6. To make the head covering flatten a two-inch cupcake liner and cut a head covering shape from the liner. Cut a curved shape in the center of the piece and insert the top of the craft stick into the slit. 7. Draw on a face with markers. 1. To make the lions mane flatten the mini cupcake liner and fold in half, cut two slits as shown on number seven of the diagram above. 2. Insert the end of a jumbo craft stick through the slits of the cupcake liner as shown on number 8 of the diagram above. 3. Glue a mini craft stick to the back of the jumbo craft stick to make the arms. 4. Draw a face with a pen or permanent marker. 1. 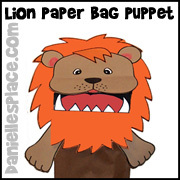 Draw a picture of a lion on card stock with it's arms up and feet pointing out to the sides as shown in the picture above. 2. 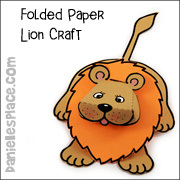 Glue the picture to another piece of card stock with Elmer's paper glue and then cut it out. 4. 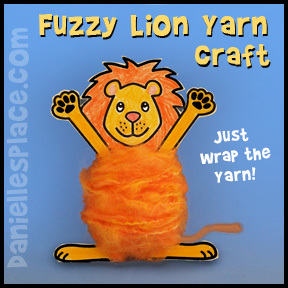 Wrap fuzzy yarn around the body of the lion until the belly is round. Use a piece of tape to tape the beginning of the yarn to the body. Stuff the end of the yarn down into wrapped yarn. Leave a short length of yarn hanging down from the back of the body for the tail. 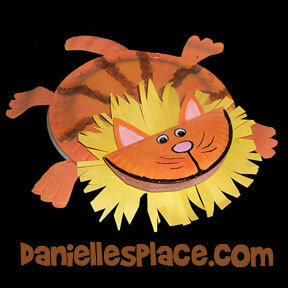 Children spin the cat and then answers questions or perform a simple activity relating to the story. Before class make up some cards with questions about the lesson written on them. Add some cards with activities written on them such as “Roar like a lion”, “Walk around the outside of the circle acting like a lion”, etc. 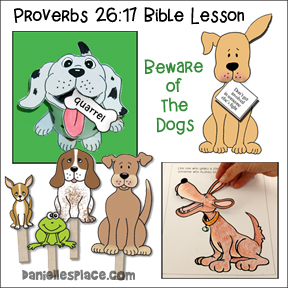 See the Scardy-Cat Bible Lesson for directions. 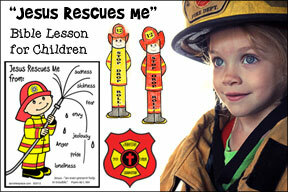 In this Lesson children learn that they can trust God to help them. God will help them be strong and stand firm against what is wrong when they ask God for help. 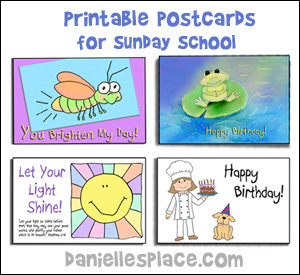 The lesson also includes a Daniel in the Lion's Den color sheet and bible verse card. 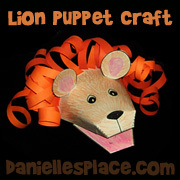 In this lesson children learn about how to overcome fear through this make-believe story about a little, scaredy-cat lion who meets Daniel in the lion's den. 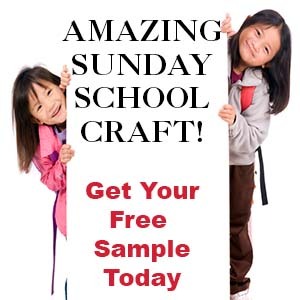 Go to the free sample lesson page. 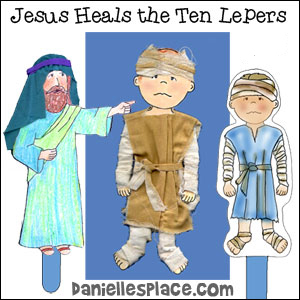 In this lesson children explore what it might have been like to be an eyewitness to the events experienced by Daniel when he was arrested and thrown into the lion's den. They explore how people communicated the news in Daniel's day and in the past, and compare it to the present. Children pretend to be eyewitnesses to the events and are interviewed by an anchorperson. The way we spread information has changed dramatically over time. The earliest books were written by hand using quill pens, and the paper was handmade from animal skins or plant materials. Some books were printed using engraved pieces of wood. Each page had to be carved into wooden block. The images and text had to be engraved as mirror images. This process could take years. Johann Gutenberg revolutionized the speed in which information could be spread with the invention of the printing press. To make a letter block the mirror image of the letter was engraved at the end of a metal rod. The rod was pushed into soft copper to form a mold. Lead was poured into the mold and when it hardened a block was formed. Each metal block with the letter at the top was carefully placed in a wood frame to spell out words and sentences in reverse order. Once the letters blocks were in the right place the frame was put on the printing press and ink was rolled over the letters. Then a sheet of paper was placed over the inked letters. The paper was pressed into the letters with the printing press and then removed. Many copies could be made in this manner. 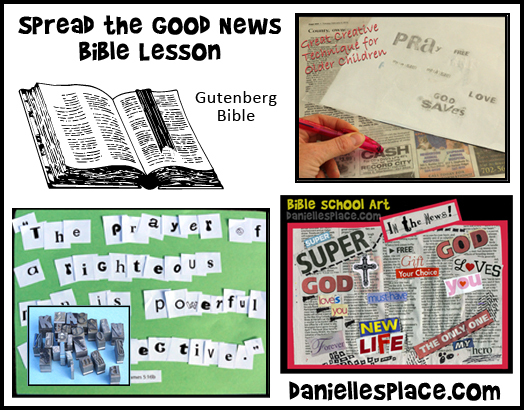 Gutenberg's first major project was printing the Bible. It is known as the Gutenberg Bible. 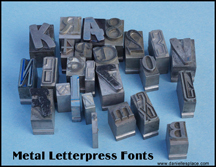 Show your children a picture of letterpress letters. Before class print out the first chapter of the Bible in reverse and make copies. Over three hundred different pieces of type were used in the Gutenberg Bible. Every letter on a page was a different piece of metal. There were 42 lines on most pages of the Bible with approximately 2,500 pieces of type per page. The metal type had to be placed backwards from right to left (a mirror image) in the correct location in a wooden frames. Give your students copies of the backwards printed text and see if they can read it. Tell them that this is what the text would have looked like in Gutenberg's press, except his was in Latin. Ask your students: Do you think it would be hard to proof this text before printing it? There were mistakes in the Gutenberg Bible. Words were crossed out by hand and the corrections were written in the margins. Ask you students to guess how many letters are on one page of their Bibles, and then have them figure out approximately how many letters there are by multiplying the number of words across by the number of lines and then multiplying that number by 5 for the average word length. Genesis Chapter 1 has 825 words so approximately 4,125 letters. 1. 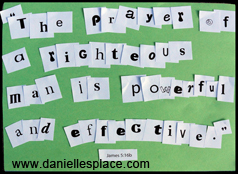 Before class print out the Bible verse letters pattern and make copies. You can use the reverse letters pattern and have your children glue them to a piece of paper backwards like a printer would have placed the letters in a printing press. 2. Have your students check their work by placing the picture up to a mirror. Or you can just have your children glue the regular letters from the bible verse letter pattern (Pattern available to members of The Resource Room) onto a piece of paper to spell out the Bible verse. You can also make it a game to see who can finish first. You can cut the letters apart before class and place each set in a Ziploc bag or have your children cut them apart during class. Make extra copies in case some letters are lost. Remind your children that the letters Gutenberg used were much smaller. If you have a computer available in class, children will enjoy practicing being printers at the Harry Ransom Center, University of Texas web site. character." -Martin Luther King, Jr.
1. Before class collect old newspapers, magazines, and ads and cut the big words out of the pages. Also cut pieces of newspaper a little smaller than a piece of construction paper to be used as canvases. 2. 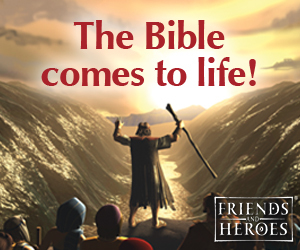 In c lass introduce the project by saying, "Although the events in the Bible happened a long time ago, they are still as exciting and important as they were when they occurred. Everyone should know and be reminded of God's amazing works. 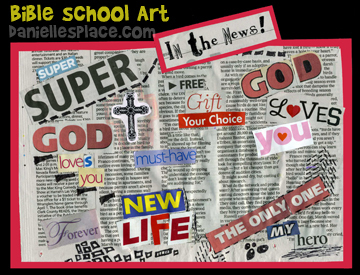 Today we are going to make a poster using newsprint to express how we feel about God, and to remind us that God's works are news worthy. 3. Pass out the newsprint sheets and the words. 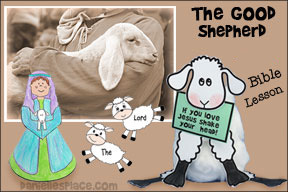 Let your children put the words together to make messages about God. They can cut up some of the words to make new words and sentences, and use markers to doodles and their own designs. 5. When they are finished have them glue their pictures onto pieces of construction paper. Lots of Newspapers - Ads and colored text do not work well. You want to use large black and white text. 1. To make things less confusing in class cut out large text areas before class. Cut waxed paper into 7" x 10" pieces. Find small smooth object students can use to rub the wax paper. 2. 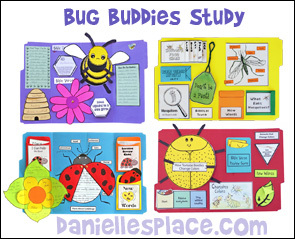 Practice this technique and make up a sample page to show your class. 3. In class give each student a rubbing utensil and a piece of wax paper. Show your students how to place the wax paper over the letter they want to use and then rub the wax paper with the tip of a pen cap or other smooth object to lift the ink off the newspaper onto the wax paper. Find the next letter you want to use and place the wax paper over that letter lining it up with the previous letter. 4. Once a letter has been rubbed it shouldn't be used again. Have your children mark off any letters they have used but coloring over them with a highlighter pen. 5. When your students are done have them glue or tape the wax paper to a white sheet of paper. 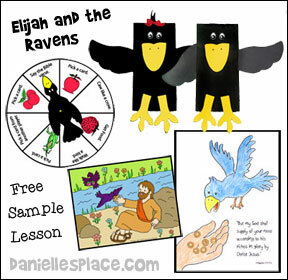 Lessons and Crafts about Daniel and Making Good Choices. The following lessons and crafts are available on The Resource Room a subscription site. 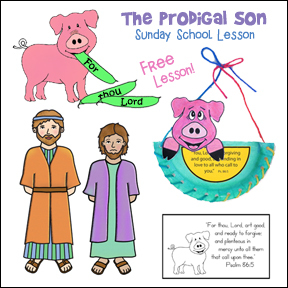 "Daniel Makes a Good Choice" Bible lesson - Children learn about Daniel and how he chose to do the right thing, to not give into the pressures around him. 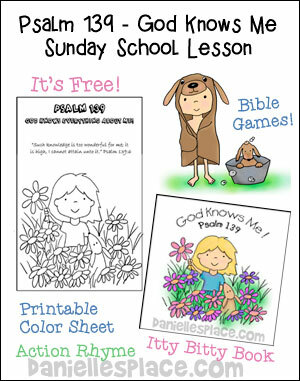 WWJD Coloring Sheet is available to members of The Resource Room. Teachers can help their students fill out a "Good Choices" chart and think about choices they make everyday.